ISKCON temple is a Hare Krishna Mandir located in Dwarka Sector 13, Delhi. This temple is managed by International Society for Krishna Consciousness (ISKCON). Many of the Delhiites and even the locals are not aware of this marvelous temple in the vicinity. The temple real name is Sri Sri Rukmini Dwarkadhish Temple. This temple was set up here in the summers of 2012. When the temple was set up here, the whole area was filled with bushes and wild plants. The Bhoomi poojan of ISKCON temple Dwarka was done on January 2013 and the inauguration of the temple was done on July 2013. Currently temple is built in small temporary structure and it will be shifted in large building. The large temple is built on land of Dwarka and donation of 70 Crore is required to build the projected building of the temple. ISKCON Mandir of Dwarka opens from 4.30 AM to 9 PM. The temple opening time is 4.30 in the morning with the beginning of Mangal Aarti. ISKCON Temple Dwarka closing timing is 9 in the evening and devotees can witness the Shayan Aarti at the time of temple closing. Multiple aartis are performed in the temple throughout the day and devotees can be the part of these aarti and offer their prayers to the Lord Krishna. First Aarti is held at 4.30 in the morning and last aarti is Shayan Aarti. Other aarti are Tulsi Aarti, Darshan Aarti, Raj Bhoga Aarti, Dhupa Aarti and Sandhya Aarti. Srimad Bhagavad Gita Classes can be attended at the temple every day from 8 to 9 in the morning and evening. ISKCON Dwarka is located in Dwarka sector 13, near to famous Hotel Radisson Blu. Dwarka is a subcity of Delhi and very well connected to rest of the city via Delhi Metro. Dwarka Sector 13 Metro station of Blue Line is very near to the temple and distance from metro station to Dwarka ISKCON temple is just 1 KM. This distance can be covered on foot in 10 minutes. Battery operated rickshaws can also be hired from metro station. Parking facility is available at the temple. ISKCON Temple Dwarka address is Sri Sri Rukmini Dwarkadhish Temple, Plot No. 4, Sector 13, Delhi. Contact details are 8800223226, Email id is info@iskcondwarka.org and website is iskcondwarka.org. 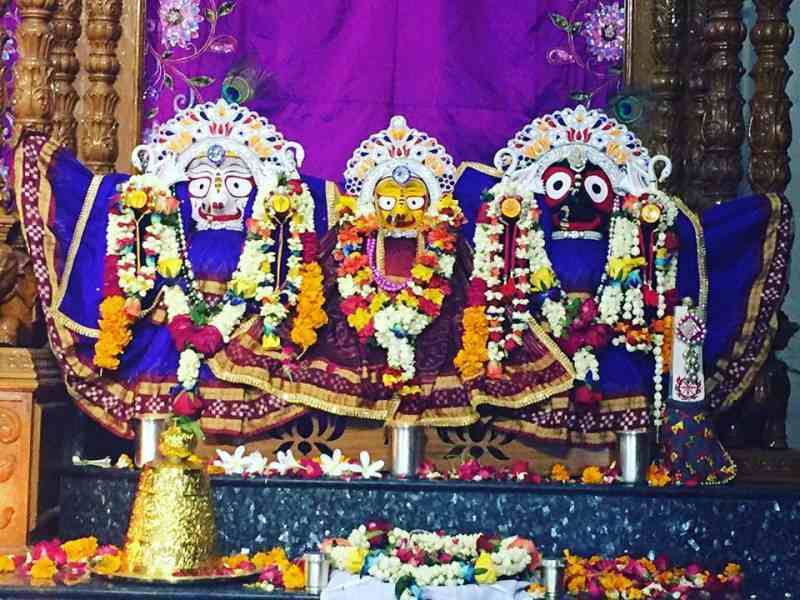 Various festivals are celebrated here like Nityanand Trayodasi, Gaura Purnima, Ram Navami, Chandan Yatra, Narsimha Chaturdashi, Jagannath Rath Yatra, Radha-Krishna: Jhulan Yatra, Balaram Jayanti, Radhashtami, Kartik and Deepawali, Govardhana Puja, Gopastami, Gita Jayanti, Harinam Sankirtan, World Holy Name Festival, Ekadashi, etc. Sri Krishna Janmashtami is the biggest festival, which is celebrated here very well. Devotees of Dwarka and other areas of Delhi gathers here for Sri Krishna Janmashtami. Janmashtami 2017 will be celebrated at this temple on 15th August 2017. The event of Janmashtami runs here for days and on the day of Janmashtami thousands of devotees gathers at the temple complex to celebrate the festival. Devotees should visit ISKCON Temple East of Kailash, ISKCON Temple Punjabi Bagh. Other famous temples of Delhi are Jhandewalan temple, Chhatarpur temple, Birla Mandir, Hanuman Mandir CP, Sai Baba Temple Lodhi Garden, Sai Baba Temple Najafgarh and Kalkaji Temple.